"This corner stone laid by Gen A C L McNaughton CB CMG DSO MC GOC-in-C 1st Canadian Army. Built for Royal Canadian Ordnance Corps by Royal Canadian Engineers. MCMXLII." The unit occupying these buildings was 1 Canadian Base Workshop and here also much equipment and many vehicles were stockpiled for the invasion of Europe in 1944. 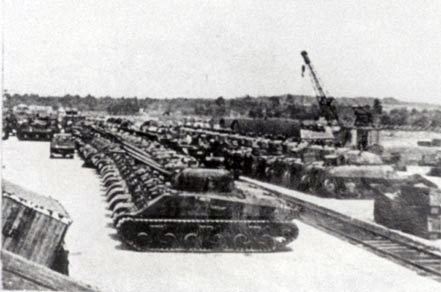 On the departure of the Canadians in 1946, the workshop area was shared between 3 Central Workshop, Royal Electrical and Mechanical Engineers and 44 Ordnance Sub Depot, whose parent unit was the Central Ordnance Depot at Chilwell. In February 1961 the two battalions amalgamated to form the School of Electrical and Mechanical Engineering, and later in the year absorbed two battalions in the REME Training Brigade, 8 Training Battalion at Taunton and 10 Training Battalion at Gosport. The Ceremonial Amalgamation of 4 and 6 Training Battalions was held on 17 March 1961, when a plaque commemorating the event was unveiled by Major General D A K Redmond OBE, Director of Electrical and Mechanical Engineering. Then in 1972, the 9 th Field Workshop (Force Troops) REME was formed, only to be absorbed five years later by the 3 rd Field Workshop REME, also a newcomer to Bordon. The 3 rd Field Workshop was formed in April 1977 an amalgamation of three REME units: 3 rd Field Workshop (Airportable) located at Weyhill, near Andover; the Workshop Squadron of the Parachute Logistic Regiment located at Aldershot; and the aforementioned 9 th Field Workshop (Force Troops). 9 th Field Workshop however continued to retain its identity as 9 th Field Workshop (Logistic Support Group) REME, and remained in Bordon. With the reorganisation of the field Army, previous company-sized workshops were grouped into battalions. By happy coincidence the first REME battalion was 6 Battalion, shortly to be replaced by 4 Battalion, thus replicating the training battalions which had for so long been in Bordon. Purpose-built accommodation was completed in June 1995 and in 1998 Vosper Thorneycroft started the teaching contract. 4 Battalion REME arrived in March 2000. In April 2004 SEME became part of the Defence College of Electro-Mechanical Engineering (DCEME) in partnership with the Royal Navy and Royal Air Force. A welcoming ceremony for Commodore Neil Latham, who has overall responsibility of the new school, was held at Prince Philip Barracks.